The endodontist's special training and experience can be valuable when a cracked tooth is suspected. 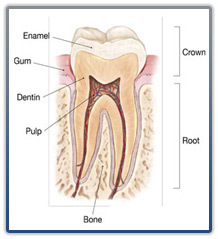 Cracks can lead to infection of the pulp tissue, which can spread to the bone and gum tissue surrounding the tooth. 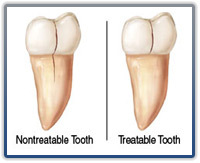 A split tooth is often the result of the long term progression of a cracked tooth. The split tooth is identified by a crack with distinct segments that can be separated. A split tooth can never be saved intact.